At Carnevale time, Venetians tend to fall into two camps: retreaters and revelers. The retreaters avoid pre-Lenten open spaces, especially at night. They take the back calles and stay clear of the Piazza (except for a mandatory ombra in the shade of the Campanile). 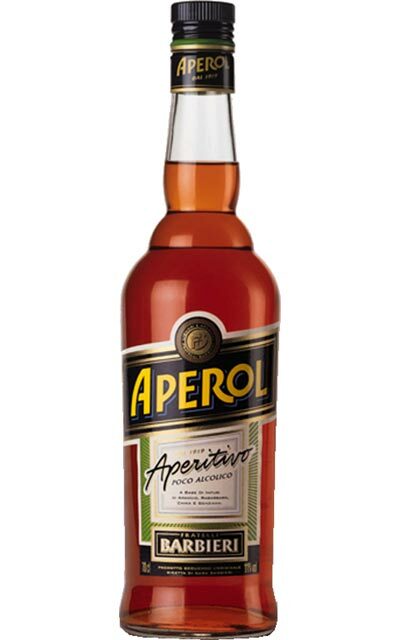 The revelers , on the other hand, dive right in and drink it up. In this latter camp is one Ms. Cat Bauer, the flaming red-haired novelist extraordinaire and woman-on-the-scene at Carnevale 2007, which is presently in full flower. For those of you who want the view from the street, Cat is blogging the Carnevale from her myspace page. Enjoy. 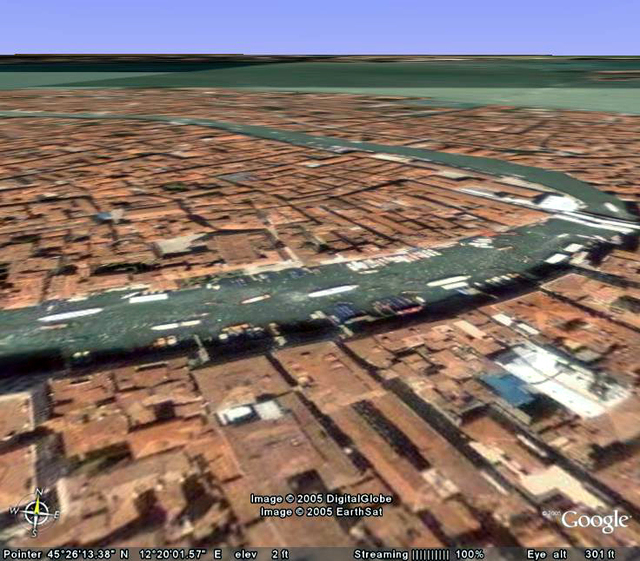 I used to think of Campo San Vidal as the landing zone on the other side of the Accademia Bridge in San Marco. A place to be rushed through, not savored. An artery. I never paid much attention to it, nor its deconsecrated Chiesa di San Vidal, with its nightly, tourist-targeted Vivaldi concerts hawked by girls in handing out leaflets wearing poofy period dresses with Nikes peeking out underneath. But after spending a couple weeks there last summer, I've formed a real affection for it. I came to love the fakey latecomer, the Palazzo Cavalli-Franchetti, with its giant, nearly Las Vegan, over-the-top turn on gothic ornamentation, all added in the 19th century. It's got a chipper little garden, a beautiful well-head, and all in all, a kind of immodest sincerity that has won me over. Now that an insurance company moved out and the Institute of Arts and Sciences has moved in, it's going to be a proper exhibition space and a fresh cultural force, something Venice can always use more of. We were up on the second floor (or first floor, if you're Italian), directly across from the Cavalli-Franchetti. We looked out of a wide bank of large windows that I speculate once led to a little loggia, suggesting that the apartment was situated on the piano nobile, the main and fanciest floor in Renaissance-era homes in Venice and elsewhere. From this perch, you had a military-grade command of every square centimeter of the campo, including the foot of the bridge and the Accademia vaporetto stop across the Canal Grande. Accordingly, people-watching was first rate. You had your teams of singing drunks at 4 AM. Lovers on the steps of the garden. Streetsweepers with those gnarly fairy-tale brooms. The gondoliers, chanting for a fare as they stood at the foot of the bridge in contra posto poses. Every form of tourist minted. Street musicans. Serious looking city officials. Carabinieri duos (looking like 15 year olds in costume). The whole parade that is Venice seemed to pour into a human canale that ebbed and flowed with the moon. 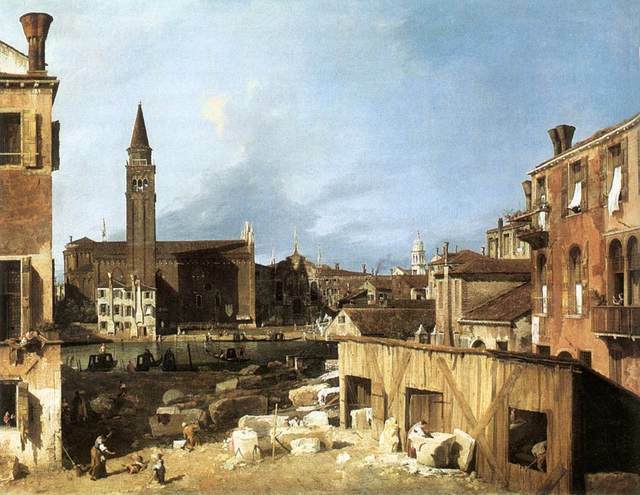 In the painting by Canaletto below, you can see Campo San Vidal as it looked in the 18th century. Across the way, you can see the church of Santa Maria della Carità when it still had its campanile and before it was morphed into the Accademia di Belle Arti. The bridge would have to wait another hundred years or so. The site of the Cavalli-Franchetti, on the left, was filled by an older palace, remnants of which, I understand, are still behind today's facade. While the painting is called The Stone Mason's Yard, what you really see is the restoration of the church of San Vidal in progress (the church itself is not visible). And on the right, I speculate, is the house we stayed in, with the missing loggia in tact. Great people-watching back then, too, no doubt, though the sound of hammers would have gotten old. In photography, "dynamic range" essentially refers to the range of brightness and darkness in an image. Take an indoor picture of a person standing by a window on a sunny day. The picture you get either has the person looking perfectly exposed and the window overexposed and "blown out", or the window is perfectly exposed and the person in way underexposed and dark. I'll bet you have dozens of these shots in a shoebox less than 100 feet away. The problem is the limited dynamic range of film or a digital camera's image sensor. 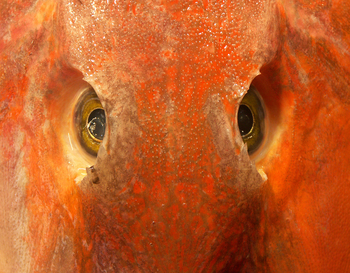 In contrast, our eyes, have an ability to see an astounding range of lights and darks. And that's where so many casual photographers go wrong. When they trip the shutter, they expect to get back what their eye saw. Problem is there eye is usually seeing much, much more in the way of dynamic range than their cameras can record. When I was in Venice in July, I experimented with a relatively new form of imaging called HDR (high dynamic range) photography. The basic concept is simple: take a series of shots of a scene at varying levels of lightness and darkness, then combine them together. There's a wonderful program called Photomatix that radically simplifies the process and works ideally with digital cameras. 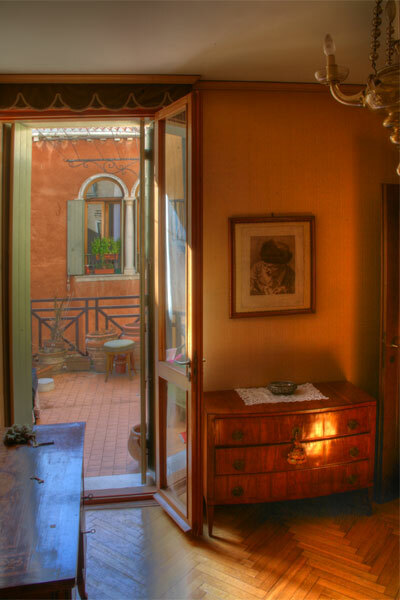 My first go at HDR photography was inside the place we rented in Venice last July. The apartment was amazing. Venetian antiques. Six windows that overlooked Campo San Vidal, the Franchetti and the Accademia bridge. 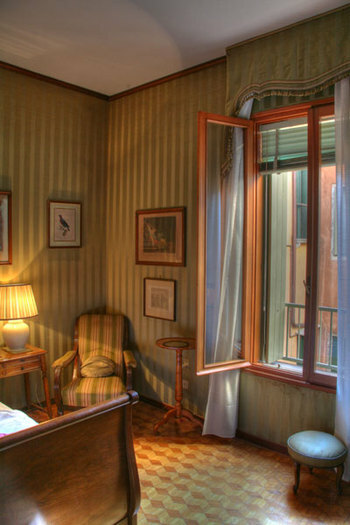 A bedroom that looked on out onto the Canal Grande. 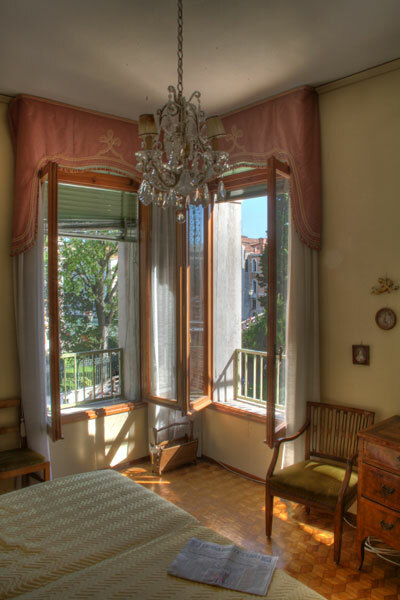 A sweet terrace, Murano chandeliers (if you like that sort of thing), great kitchen, air condo. Perfect. Here are 4 HDR images of the apartment. It seemed like a good application of the technique because the magic of the place was both indoors and outdoors, and conventional photography would totally miss this context. Here's our bedroom. You see a hint of the Accademia bridge and a palazzo across the Canal Grande. 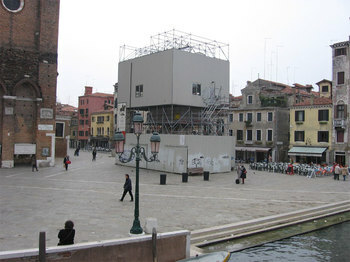 Here's a shot in the living room, with the Palazzo Cavali Franchetti in the background, across Campo San Vidal. (This is the first shot I ever made with the HDR method ... darkish but has a nice mood. Here's the room my 4 year old son, Miles got. It's a space where the HDR technique shines. The room is rather dark, as it is covered with that shiny green fabric. It's mainly lit by a single light bulb and any natural light. This is a scene that would have a huge amount of pure black in the shadows. With HDR imaging, however, literally every corner of the room has detail -- even under the stool. 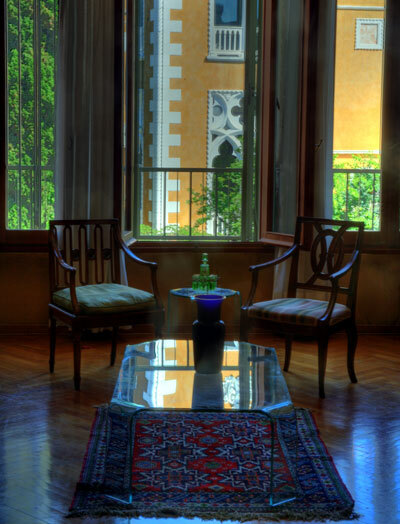 Here's another one, looking from the study onto the terrace (and the Dutch consulate). That's a cool print of Joseph Brodsky on the wall. Lots of posts coming when I get back ... upload logistics are challenging here. I have shot more than 3000 photos. Stay tuned. We were in the Piazza on Sunday night when Italy took the World Cup ... lots of restrained exuberance, big flag waving, hugging, singing. The orchestra at I Quadri, wearing Azzurri shirts, playing "We Are The Champions" at the moment the results became official. For the unrestrained form of exuberance, you had to be closer to one of the 3 bridges crossing the Canal Grande, where kids were playing cat and mouse with the Polizia free-diving into the pitch dark from the crest of the crossings. Check out the photos below, from the Accademia bridge, at about 2 in the AM. Things were rocking at Campo Santa Margherita, as would be expected. There was a crowd of about 300 people, including one group that was banging on a newstand with sticks, bottles and hands in an impromptu drum circle kind of thing. Decibel level .. off the charts. 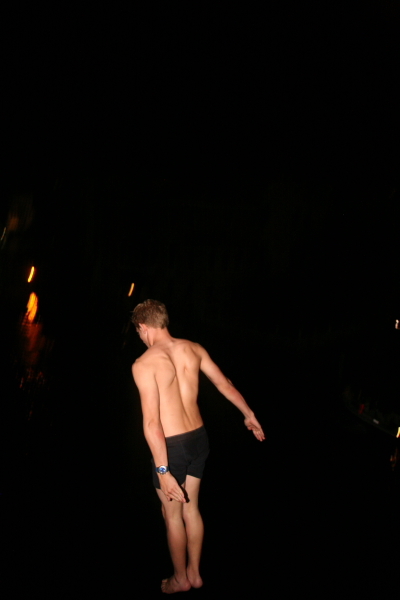 More swimming by the Ponte dei Pugni. Type Venice into Ebay tonight, and you get a list of about 2600 items up for auction. Some cool stuff in there, but there are too many misses. Venice, California. Venice, Florida. Shoes.Thomas Kincade painting (kill me now). Endless bad postcards. Gondola charms. So here's a magic potion. Copy and paste this into the Ebay auction search engine. It cuts the lame listings around in half. I would have made it longer, but Ebay has a limit. You still have to slog through about a thousand or so listings, but at least it's browsable. Maybe you can improve on it for me by knocking out some of the less potent filters and replacing them with better ones. NASA oceanographers announced this month that sea level rose, on average, 3 millimeters (0.1 inches) per year between 1993 and 2005. They think about half came from melting ice and half from thermal expansion as the ocean soaks up heat from global warming. The trend line seems pretty obvious. Equally obvious are the perilous implications for coastal, sea-level cities like Venice. 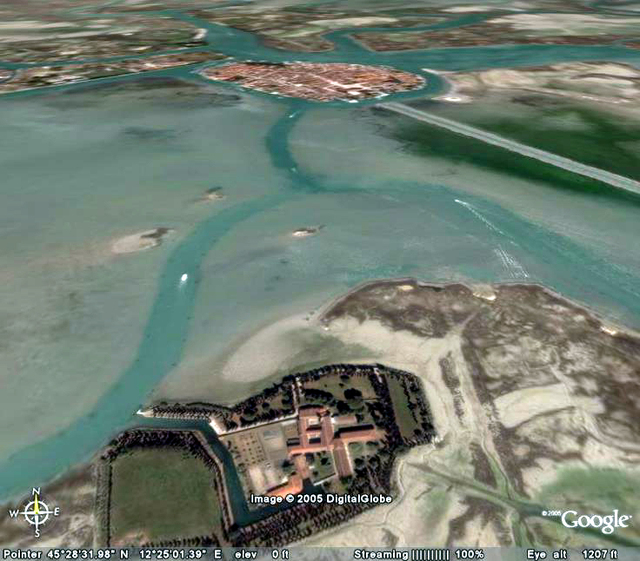 Venice's countermeasures, including the MOSE dike system and the raising of the lagoon-facing quays, can forestall flooding. But if the trend is relentless, we're really just buying a few ticks on the geologic time game clock. And unless we begin to actively think about what can be done to reverse the trend itself, we will have to consider accepting Venice's eventual surrender to the sea. Ah, but the linear trend is not that spooky, right? Let's see, an inch every 10 years or so ... less than a foot a century, right? Maybe we'll just roll up our pant legs a bit and build higher walls. Unfortunately, there's reason to believe the trend may become curvilinear, ascending in a graceful, lethal upward swoop. Earth's floating glaciers function as a kind of mirror, reflecting some of the sun's energy out of the atmosphere and into space. But as the floating glaciers melt from the effects of global warming, this mirror effect disappears and the sun's energy can directly heat the ocean previously beneath the glaciers . And the ocean retains, rather than reflects heat. 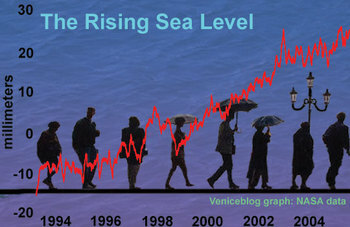 So while we may be seeing a gradual sea rise due to glacial melt, once the glacial is gone, things may get hot fast. Very fast. And the bathtub quickly overflows. Please see the film An Inconvenient Truth. It's in theaters across the country right now. It lays bare the incredible peril in which human-derived global warming has placed our planet. It doesn't matter what your political persuasion is, or for that matter, what side of the global warming issue you find yourself. See the film, judge for yourself. I guarantee you'll be moved, if not radicalized. The film follows former Vice President, Al Gore, as he trudges from city to city across the globe making a stunning multimedia presentation of what he calls our "planetary emergency". Gore has redirected his stumping skills, and instead of campaigning for himself, he's asking us to vote for the Earth in a bid to raise consciousness and stir political action. The film is frightening, hopeful, extremely intelligent and very, very motivating. Politics and politicians polarize. I have no idea of your political POV, but there's about a 50% chance, in this country, it's different than mine. Al Gore has advanced a liberal Democratic agenda his whole life. Forget that. For real. He is not selling anything in this film other than defense of the planet. I was fortunate enough to see Gore's presentation live last February at the TED Conference. Afterward, I spoke to him about Venice, a city he also loves. I told him a bit about the controversy around the MOSE floating dike project, and he talked about the lumbering political processes that are needed to galvanize people around real solutions. I'm hoping this film quickens the step. Has Enough Money Been Spent Trying To Save Venice? 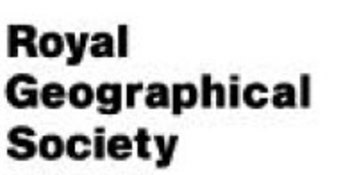 "The Royal Geographical Society in Britain has a debate in London next Monday evening, 12 June, on the question "Has enough money been spent saving Venice?" Tickets a bit pricey - £20 - but the speakers are very distinguished." Should be lively. I wonder if the Dutch ever debated "has enough (as in too much) money been spent saving the Netherlands from the sea?" 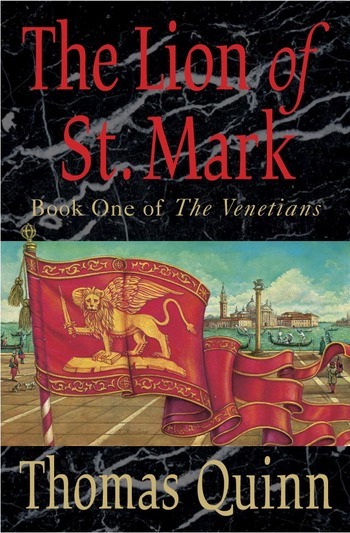 I've been looking for children's books about Venice so I can get my bambini properly propagandized before the July trip. I figured the Marco Polo story had probably been defanged and sweetened into kiddy format by some children's author somewhere, since the protagonist was young and adventurous. 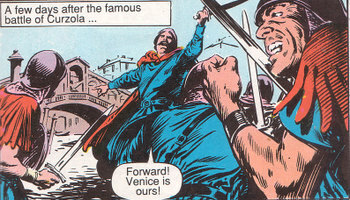 All I could find was an out of print Classic Comics edition published by Gallery Books called Journey of Marco Polo. They lost me exactly 4 seconds into the book. Here are the first 2 frames. Count the errors. Frame 1 ... no navy ever sailed into Venice until the French in 1797 ... Santa Maria della Salute was built over 350 years later. Frame 2 .... the Rialto bridge was built about 300 years later ... no army, navy, airforce or garden club ever captured Venice during the Republic other than Napoleon ... the battle of Curzola was fought a year earlier in the seas of southern Dalmatia. I'm surprised we don't see a vaporetto chugging through the Molo or an Internet cafe in the background. If you really want to feel like a freak in Venice, walk around without a cell phone. Italy has among the highest cell penetration and the cheapest airtime in the world. You'll even see gondoliers yacking on their telefonini with passengers on board. Truth is, I've never had a cell in Venice, and it's caused many a logistical inelegance, not to mention the sting of the stigma of being off the grid in a place where Nokia and Ericsson are as well known as Tintoretto and Titian. I took some "high powered" hand-held radio tranceivers with me a few years back, and instead of the promised "one mile range" I wasn't able to get a clear signal from one end of the Piazza to the other. Plus I looked like a dork. Over. I'm supposedly a consumer technology expert, so I figured I needed to crack this cipher before going back to Venice in July. Solution: For under $60, shipped, I snagged two used Motorola V66 cellphones on Ebay. Nothing exciting ... slim, flip-open, mono-screen. 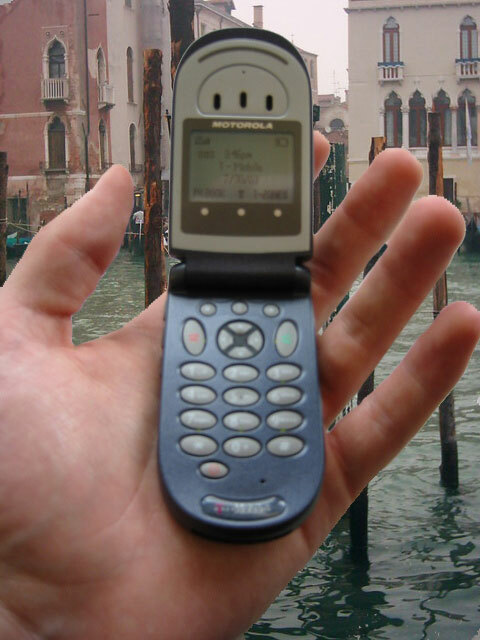 But they are tri-band GSM babies, which means I can pop in a TIM or Vodaphone SIM card - available for purchase everywhere in Venice - and go. Many if not most Italians use the same pay-as-you-go method. There are rental places on the net, but they are ripoffs. They charge more for a two week rental for one phone than it cost me to buy two. And they totally hose you on the airtime/SIM cards. So brew your own. Ebay sticks it to the man once again. According to the Comune di Venezia, more and more wedding gondolas are being filled with non-Italians. Over the last decade, there has been a 254% increase in the number of marriages in Venice in which both groom and bride were foreigners (see the Veniceblog graph below). Mostly it's other Europeans (85%), with only a smattering from North America (7%). Guess I was ahead of my time, though I wish I hadn't been. I had an ill-starred wedding there myself in 1992. 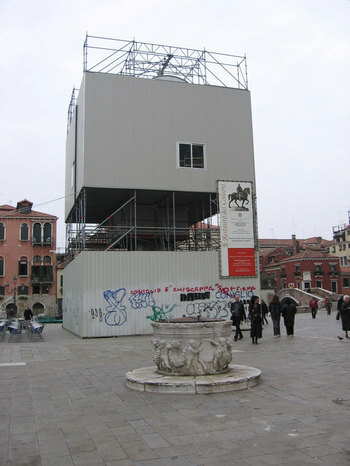 Power to the La Fenice opera house mysteriously shut down yesterday, disabling the sophisticated fire prevention technology that was installed to prevent a repeat of the 1997 tragedy, when the landmark jewelbox was reduced to a smoldering pit. Members of the National Fire Department swarmed over La Fenice and Campo San Fantin. The resulting insanity rousted some 900 students and teachers -- many from out of town -- from their nearby hotels and forced them scrambling for other accomodations. In the end, it was a dead computer back-up battery. Over the last few months, I've gotten a few emails from folks wondering about how people with disabilities might best cope with barriers when visiting Venice. A city of bridges, stairs and water creates formidable logistical challenges, to put it mildly. Message to handicapped folks: Venice is, true, harder than most destinations to visit, but it's worth every extra erg of energy. You can have an amazing trip there, even if you're wheelchair bound. This surprised me. Only about 20% of the fish sold at the Rialto fish market come from local waters.This according to a new statistical bulletin put out by Il Mercato Ittico del Tronchetto, as reported in today's Gazzettino. While some come from other spots in Italy, the majority are from other parts of the world, mainly Northern Europe, Asia, and South America. Shrimp from Argentina. Cuttlefish from Malaysia. Squid from Norway and Thailand. Reasons? Lower production levels in the local Adriatic waters and in the Venetian lagoon combined with the effect of the globalization of markets. The news, however, is not all bad. 2005 local production is actually up 20%, so it may be turning around. ACTV has just hiked the vaporetto ticket prices in time for Carnevale. Basic, one way, non-Grand Canal trips, now cost 5 euros, up from 3.50 euros. That's pretty major. Day passes go up too (10.50 euros from 12.60 euros), but remain the better deal. Of course, for gamblers, there's always the Free Vaporetto Dance. Apparently Michael Jackson flew into Marco Polo Airport incognito with his two kids last week, but he left immediately before disembarking when word slipped. The airport reception area was reportedly jammed with media. His reason for coming to town? Beyond merely bizarre, of course. According to a Roman Catholic Church spokesperson, Jackson has been in secret discussions with the Vatican in a bid to put the prayers of late Pope John Paul II to music. Venice somehow figured into the deal, though nobody's quite sure how (perhaps he was there to meet the Patriarch, Angelo Scola). A paper Canalazzo, about 7 feet long. Natalie Venezia and Miles, on the job. Nat imagines submarines gliding under the Rialto. Miles wanted to put a boat on top of a palazzo. It's all for Grandma's 67th birthday ... we're "taking her to [paper] Venice". To see the masterpiece full-up, click here. Authorities are looking for some cruelly inventive kids who started an impromptu game of pigeon football in Piazza San Marco yesterday. Lots of witnesses saw the feather-flying action, but apparently, the carabinieri arrived after the final whistle. At the end, 6 birds had retired permanently from the league with fatal injuries. On the case for the city of Venice is Maurizio Francesconi, a kind of animal detective who's cracked similar cases in the past. Recently, after a pigeon pummeling in Campo Santa Maria Formosa caused a city-wide uproar, Francesconi made the collar -- a case that led to a change in the law, escalating the penalty beyond fines to actual criminal charges. Somebody call The Fox Network. I smell a reality show based on Francesconi's cases. What would we call it though? Let's see now. The Calatrava bridge over the Canal Grande, connecting the train station with Piazzale Roma was supposed to be completed in June 2004. Febuary 2006: no bridge. Cost overruns are reported to be in the 1 million euros plus territory. Glancing at my watch, it appears to be time to sue someone. Accordingly, there's been an official inquiry into the delays, and yesterday, the engineer and architect responsible for the audit concluded that the construction company made serious judgment errors in estimating costs, anticipating the archeological challenges, and even the in the way in which the bridge's construction materials were spec-ed out. Next up, lawyers. Lots of them. The sharks are circling around famed Spanish architect, Santiago Calatrava himself, among others. Not sure if there's even a fake date for anticipated completion of the bridge. I've just posted a full, 360-degree panoramic image of Piazza San Marco at night. Click here to see it. As you'll notice, the image is exceptionally wide. The Piazza is bathed in gold. The slow exposure fills the square with a nice mixture of ghosts and real people. There's the nightly battle of the bands between I Quadri and the Florian cafes. I am in the process right now of printing this image out 2 X 20 feet large on an Epson Stylus 7800 printer. (It's whirring away in the background as I write). The Epson outputs astonishingly detailed prints that are completely indistinguishable from conventional photo prints. And of course, creating a 20 foot wide print is all but impossible using "conventional" darkroom techniques. At the huge size, the print is quite emersive. 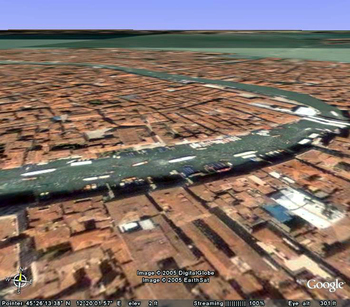 For me, the miracle of Venice is the omnispheric, 360-degree nature of its beauty. It isn't a gasp from just one angle. It's on all sides of you. Everywhere you turn. Like the photo. The drill this year is to mount a show and sell fine art prints. Mostly of Venice. Many images, especially the panoramics, have been hemmed up because of a bottleneck with the scanning and printing process. Scanning panoramic negatives is a bear, as only a few models can handle their whole length. And my previous printer topped out at a measly 44 by 19 inches, radically limiting panoramics. But in the last couple months, in addition to the Epson 7800 printer, I acquired an Imacon Flextight scanner. Together, these machines free genies from bottles. The photo was shot with a Seitz Roundshot 35/35s. The Roundshot is mounted to a tripod and physically spins around in a circle in order to "look at" the whole scene. It took more than 2 minutes for the camera to complete its rotation, since the amount of light in the Piazza was low and it needed a long exposure time. I set up in the mathematical middle of the square on the left/right dimension, a spot that was easy to find because of the paving stone patterns. Because of an attack perpetrated by unknown persons on the evening of the 17th of December and continuing until the morning of the 19th, the Internet Site of the City of Venice is online only in a minimal version. We apologize to the users. The complete version of the site will be on-line as soon as possible. Sheesh. That was some hack. Looks like the destruction took place over a couple days. That's very unusual (security anyone?). As a result, the some of the best webcams are inaccessible (I've gotten like 10 emails about that). But that minor inconvenience pales next to the incredible hassle the attack causes to the citizenry ... the site is a real nerve center, very deep and well constructed. What a mindless crime. 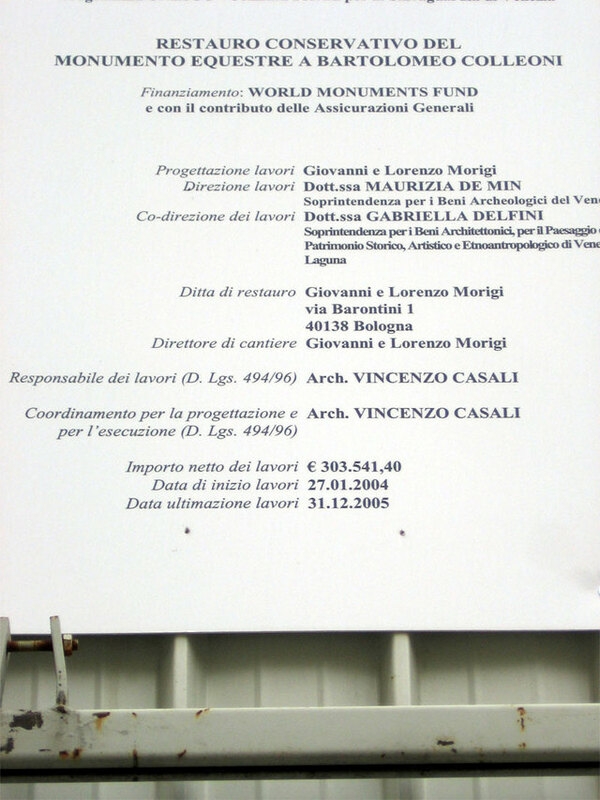 After a long court battle with military authorities, it was just announced that the Comune of Venezia -- Venice's city government -- has been awarded possession of a little island with a somber past: Lazzaretto Nuovo. It was there, in 1468, that an isolation hospital was built for those who were suspected of having the bubonic plague. So if you were a relative or intimate of someone who had or had died of the plague, you might have gotten a surprise knock on the door and a complimentary boat ride to this 2 hectare patch of land poking out of the lagoon off of Sant' Erasmo. While forced wintering on Lazzaretto Nuovo would have been a immense drag, it was like a beach party on Ibiza compared to being consigned to Lazzaretto Vecchio, the other plague isolation hospital (near the Lido), where those who actually had full-blown cases of the plague were locked up. That, as you can imagine, was almost always a one-way gondola ride. Lazzaretto Nuovo has extraordinary archeological value and is a lovely little place today, so it's a great thing the city managed to snag it. It's thought to have been inhabited perhaps as far back as the Bronze Age, though there is solid evidence dating to at least 1015. 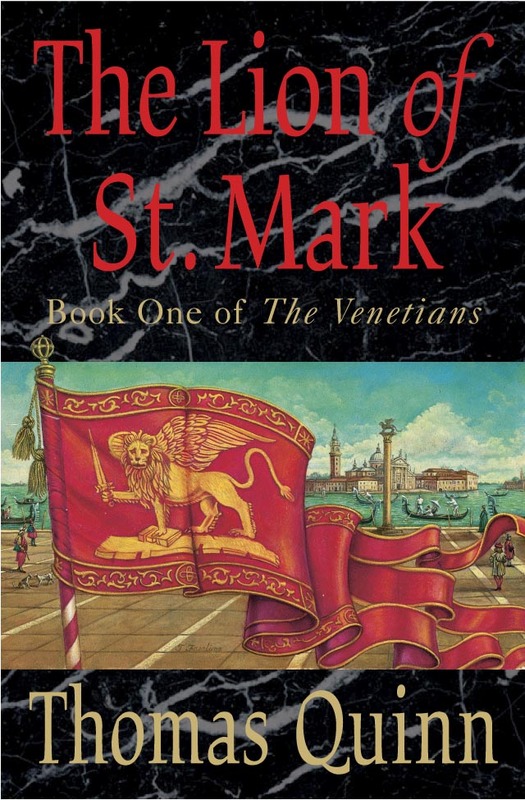 The monks of San Giorgio Maggiore built a church there in the 12th century, when it was known as Vigna Murada (literally, "walled vineyard"), and it has had military importance to Venice and its occupiers, owing to its strategic position near the Porto di Lido, the main door into Venice from the Adriatic. One of the worst acqua altas in recent times ravaged Venice Saturday, with waters cresting at 132 cm, putting roughly 70% of the city under the flood. Heights averaged 50 cm in Piazza San Marco, though a glance at the web cams a moment ago shows that it has receded. This time the floods were accompanied by liquid sewage and a potent stench, especially on the island of Murano. The fire department has had its hands full recovering boats that had been torn from their moorings. Meanwhile, Mayor Massimo Cacciari has been actively opposing the construction of the MOSE floodgates, preferring methods that don't affect the natural flow of water into and out of the lagoon from the Adriatic. He's managed to wangle a temporary work suspension, though the project, still slated for completion in 2011, will be very tough to derail. Cacciari's opposition has riled many, including his longtime nemesis, the president of the Veneto region, Giancarlo Galan, who once famously indicted Cacciari for negligence in the burning of the La Fenice opera house (he was acquitted). Says Galan of the latest flood, deriding Cacciari's lack of potent alternatives to MOSE: "What do the geniuses and scientists of Topolinia say now?" Topolinia translates, roughly, to "Disneyland". Catherine, in Venice at the moment, wrote me that she had seen an article in a local paper in the last week about a special vaporetto service that only picked up Venetians. She didn't get it all (the Italian, I presume), and asked me to post about it. I checked Il Gazzettino for the month and searched the words vaporetto and vaporetti, and found nothing about the issue. Maybe she saw it in La Nuova Venezia. 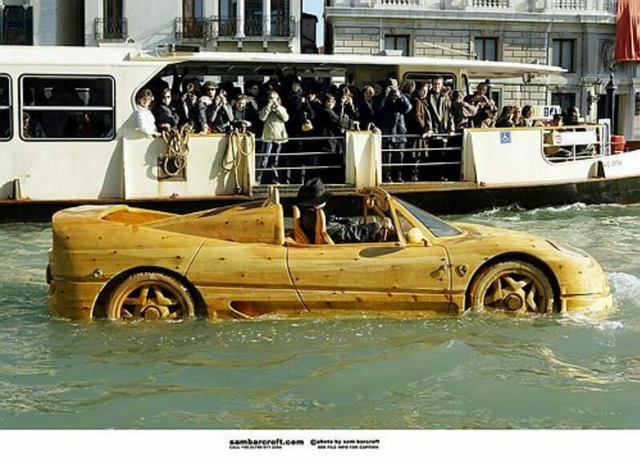 I know that Venetians hate the overcrowding on the Canal Grande, so it might be tempting -- in fact, I mentioned this to my wife yesterday, believe it or not. But running two vap services would be extremely expensive/inefficient. There are so few Venetians. To add a second line for them would be crazy, not to mention the worsening of the crowding of the waterways and the extra moto ondoso, already at a crisis stage. Has anyone heard/read anything about this? For me, one of life's enduring mysteries mysteries is why it is not possible to obtain a croissaint in all of Venice without it being shot full of apricot jam. Not orange, peach, raspberry. Not 80% or 95% of the time. Always apricot jam, everywhere. Or so it seems. I'm flummoxed by the cornetto marmellata all'albicocca. It seems so random. Why apricot? Or for that matter why anything? Venice has such a brilliant tradition of pastry making. Yet here, instead, we have these undersized, generally sub-fresh jelly vessels where a warm, flakey, buttery crescent is supposed to be. Why should proper croissaint technology elude them? What do the French do for breakfast when they come to Venise? Quelle horreur! 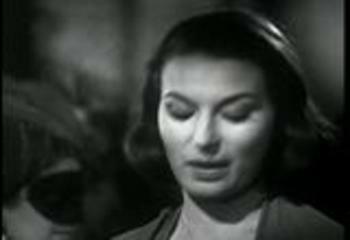 Silvana Mangano plays a lovely Venetian shopgirl whose life is inalterably re-choreographed by a bad-boy dancer, in the 1954 feature-film, Mambo, directed by Roberto Rosen and produced by Dino De Laurentiis. You can download the public domain film free and legally here. Free is good. Hi-res and everything. And while we're on the topic, what's your favorite film featuring Venice? Leave me a comment or email me. Personally, I'm not sure that a truly killer Venice-set movie has been made yet. I always seem to find myself looking more at the city than the actors, which is not a good sign. Topping my list would be The Comfort of Strangers, I think, or possibly Senso. What do you think? Wired News has a story today about a group of artists and technologists that have cobbled together a “location aware” PDA-based tour of one of the less-traveled sestieri of Venice, Castello. Check it out. The system, still in an experimental stage, uses Bluetooth technology to inform the PDA of local attractions/points of interest, triggering pre-loaded content on the device. Judging from the accounts of the system, it sounds like this is really only a “proof of concept”, but it still makes me smile. A couple interesting things about this. The first has nothing to do with technology. One of the project’s missions was to pioneer ways to use information to romance Castello, and hopefully, draw tourists out of the main sightseeing areas and into less-frequented parts of the city. It’s a kind of touristic load-balancing that Venice desperately needs. The other thing that stokes me is the prospect of using location-aware devices and object-recognition technology to allow destinations – like Venice – to tell their stories to travelers. It pierces the veil of ignorance that keeps a visitor from understanding the context, history and deeper meaning of where they stand. There are numerous emerging technologies that will, without any doubt, transform the concept of “guidebook” in radical ways. Here, for instance, is a kooky looking “heads-up display” system that was experimentally deployed in Austria by researchers. It's built around “smart glasses” which interactively annotate your environment and tell you what you’re looking at. Warning: you’ll have to peer past the (formidable) ergonomic and aesthetic problems prototypes like these have and take it on faith that, eventually, you won’t need to walk around Piazza San Marco looking like The Terminator or a mutant grasshopper. Other than the city itself, one of the most wonderful things about the year-and-a-half I lived in Venice without a 9-to-5 job was the time I had to explore personal passions. Precious time without a clock roaring in my ears. I’m blessed or cursed, depending on your perspective, with many abnormally compelling interests. One is music. I play a bunch of instruments, and dragged a half-ton of gear with me to Venice including some guitars, a long, heavy digital piano, some amps, mics, and a few book boxes of cables, jacks, clips and God knows what else. For the first time in a long time, I was really able to improve my chops, digging into old blues and barrelhouse piano bits and Hendrix guitar licks I was never able to crack before. I also cranked out a few “mash-ups” … sliced-up snips of songs that, when smooshed together, become completely different, unique songs in their own right. It’s a kind of audio collaging that I first learned by watching my chum, the celebrated old-school hip-hop remixer, Steinski. These days, there are amazing audio programs like Ableton’s Live that let you slice and dice like a nuclear Veg-o-matic. But this was 1998, and I was then driving a shiny Mac Powerbook 3400 at a blistering 240mhz with a long-discontinued program called Soundedit 16. My cell phone – no joke – has a faster processor and runs more complex software. Interesting coda: through a connection at National Public Radio, this recording found its way to The Doors keyboardist, Ray Manzarak, who surprised me with a phone call and some very nice words. Ray baby … I’m ready when you are. 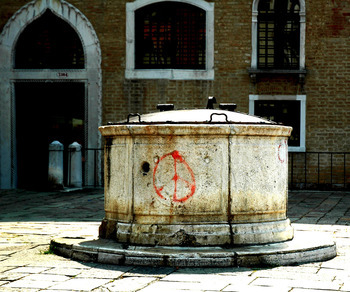 In the last half century, the wells (or pozzi, as they're known) that grace the campi of the Venice have been sealed over with concrete and then, typically, crowned with a ultra-heavy cast-iron lid. So last week, police were understandably puzzled as to how and why someone pried off the massive cap off of a pozzo in the Campiello dei Calegheri, near the Fenice, and disappeared into the night with it. It had no artistic, historic or economic value. And it's not exactly like you could roll it unnoticed down the calle (and over bridges) like a hula hoop. If you happen to be in Venice on November 10th, be sure to make your way to the cemetery island of San Michele where they will be unveling a lovely new furnace in the crematorium. 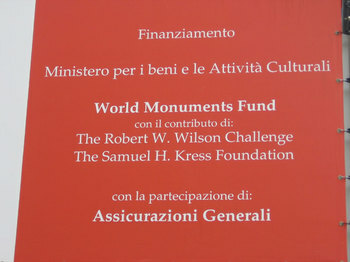 According to the Gazzettino, "associates, friends and supporters" of the cemetery will all be in attendance. No word on refreshments, however, so bring a flask to be safe. Most places, when a water main bursts under the city streets, you're looking at a world of trouble. Traffic back-ups. Property damage. Business shut-downs. Not so in Venice. 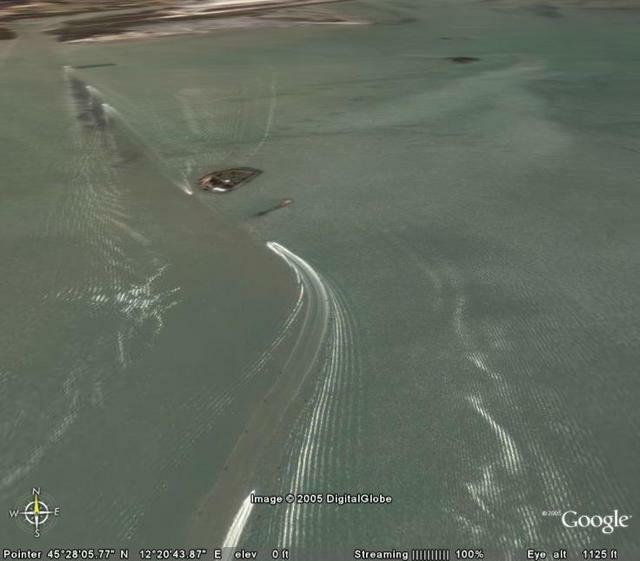 It took a while before anyone even noticed the huge pipe rupture near Fondamenta Nuova that caused untold thousands of gallons of precious drinking water to blast into the lagoon last October 21st. Even then, it took Vesta (the public utility that handles water management) 5 days to fix it. To be clear this is not a traveler's advisory. 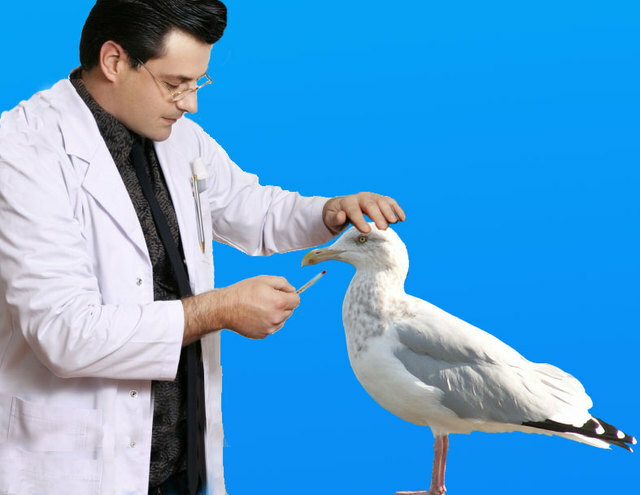 But the Gazzettino is reporting that seven gulls have been found dead in the waters of the northern lagoon near Treporti, and authorities are taking all possible precautions to ensure that they weren't done-in by the H5N1 avian flu virus. Two infected birds were identified in the UK this week, and Western Europe is on high alert on the face of a potential pandemic. 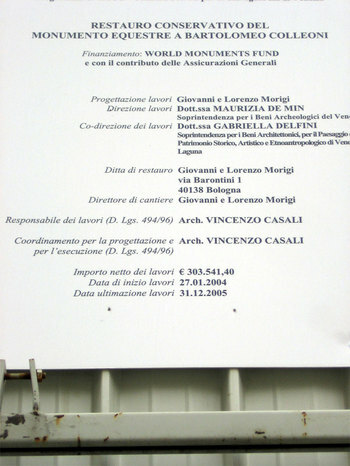 The Istituto Zooprofilattico di Legnaro is investigating. 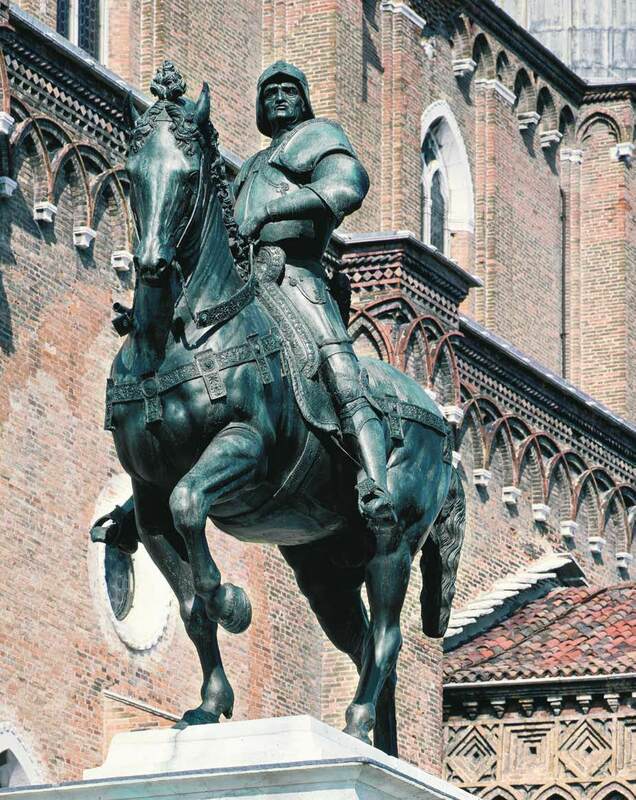 Above, a picture taken a couple weeks ago of one of my absolute favorite works of art in Venice: Andrea Verrocchio’s statue of the condottiero, Bartolomeo Colleoni. “We have a right to say that this equestrian statute is the finest in the world", wrote 19th century Swiss cultural historian and art history pioneer, Jacob Burkhardt. I couldn’t agree more. Here, Colleoni commands Campo SS. Giovanni e Paolo with an inscrutable power, his stern, intelligent eyes cast almost sadly downward toward some unseen field of victory. Even beauty-inured Venetians will often stop at the feet of Verrocchio’s masterpiece for a few moments, a place too splendid to pass in blind routine. “Verrocchio’s statue continually recomposes itself before your eyes as you walk around it”, writes art critic Andrew Butterfield . It’s true. No matter where you stand in the campo, it’s masterful. There’s no wrong place to gaze upon it. In this close-up we can see the mighty profile of the stallion, with the flesh of its strained neck more like pure, raw muscle than the skin of a warhorse. And here, the bust of Bartolomeo himself. Verrocchio spared nothing, sculpting facets and character that simply cannot be seen from the campo paving stones. Yes, I am being a little sarcastic. 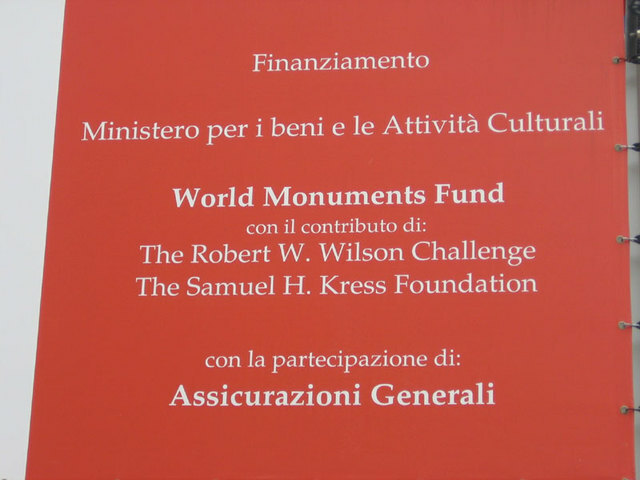 Accordingly, I want it to be known that I feel a kind of urgent gratitude to the organizations and talented workers that have undertaken the restoration or conservation of the infrastructure, buildings and monuments of Venice. The battle against entropy is valiant. They are soldiers protecting artistic frontiers from time. Yet I admit it is an uneasy gratitude. Because at any given moment, some city’s most beautiful faces are covered with veils that keep us from enjoying them for long stretches of time -- almost always far longer than originally promised. Selfishly, I miss these masterworks. Yes, there’s the rational, dental logic: “take care of your teeth or they’ll all fall out“. But there’s a child inside me that won’t shut-up and doesn’t care what the grown-up inside me has to say about the matter. I want candy. Where’s my statue? It would be easier if, like an actor who drops out of sight for a few weeks to get a little face adjustment, the process were relatively quick and discrete. The Gazzettino reported recently that the work should be done next Spring, roughly 2 years after it began. In the meantime? You get the architectural masterpiece you see above, something akin to a three-story, graffiti-covered grey outhouse, only much uglier. The pictures were sent to me by a Venice resident who lives close to the campo, and who gets angrier and angrier every time he passes through. Here’s the English version of the official Colleoni restoration website. There are many cool pictures and a fascinating little video of the work in progress. Oh, and here are some great shots of the statue before the fix. Hopefully Bart will be back in the saddle soon. Translated/paraphrased from an article by Gianpaolo Bonzio in today's Gazzettino. Every year, another Venetian bakery lowers its shutters forever. The financial pressures on bakers in the city are inexorable, and hope is in short supply. In 1985, there were 55 active bakeries in the historic center of Venice. In 20 years, the number has been sliced to 34. 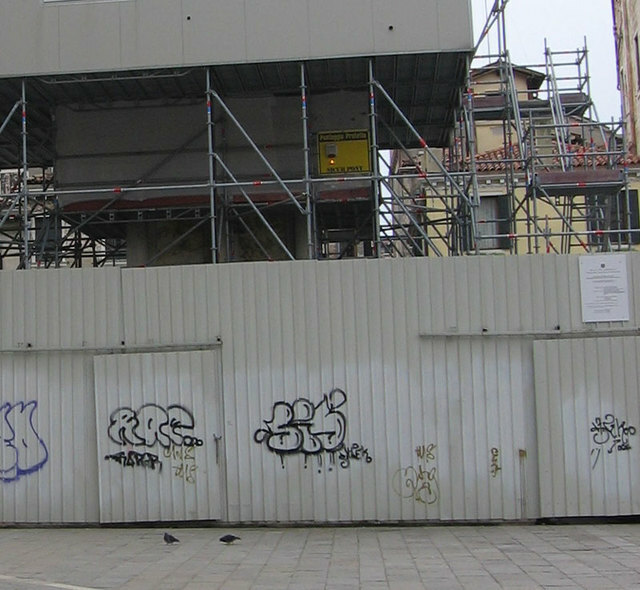 Only 5 remain in the sestiere of San Marco. Despite these chilling numbers, the Venetian panificatori have no intention of letting go without a fight. And this Friday and Saturday from 11AM to 530PM, there will be a large demonstration in Campo Santo Stefano, Campo San Polo, and on via Garabaldi and Strada Nuova, in which consciousnesses will be raised and free bread and other baked goods will be given away gratis. According to the president of the Venetian baker’s association, Paulo Stefani, “our standards have always been extremely high, yet our prospects are not encouraging. Our costs – particularly for rent -- are much steeper than in other Italian cities. Space is limited. Local labor is expensive. There is an enormous cost for maintenance and repair. Highly specialized workers have to travel to Venice in order to send the heavy machinery to workshops outside from the historical center ". What needs to be done, according to Paolo, is to “defiscalize” the bakeries [i.e., to subsidize them]. And while the Venetian intelligentsia is considering ways of dealing with the problem, the point of next weekend’s demonstrations is to carry the message directly to the Venetian people, and above all, to the city government. I got about 15 responses in a day or so to the "mystery photo", which, once again, wasn't too mysterious. To a person, EVERYONE identified Buffalo Bill Cody. Correctly identifying one of the Native Americans with him proved a little tougher. "Sitting Bull" was a popular, but incorrect response. The correct answer was either Long Bear or Chief American Horse. The gondolier's name was Coolio Schulman, but I didn't expect really anyone to get that. The first genius with the correct answer was Judi B. A fine book will be winging its way to her shortly. Some say we Americans are a bit conspiciuous in Venice. Easy to spot. 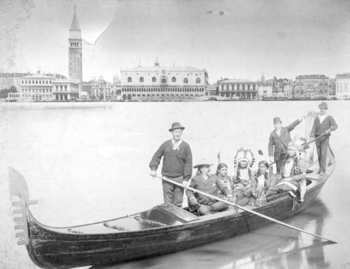 Well, maybe so, but today's Americans in Venice are downright subtle compared to this distinguished group of Yanks, on holiday before the turn of the century. (Click for an enlargement). 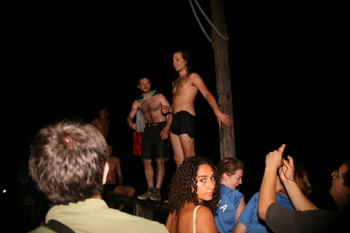 Think you can name two members of this august expeditionary party? Leave a comment or email me at brancamenta@hotmail.com with the right answer, and you'll get a cool little book of watercolors of the Venetian lagoon. Yee-haw. 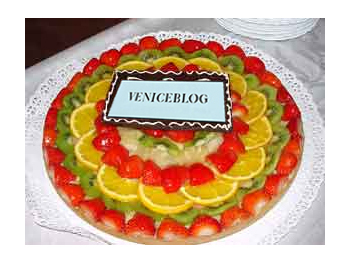 The first post on Veniceblog was two years ago today. 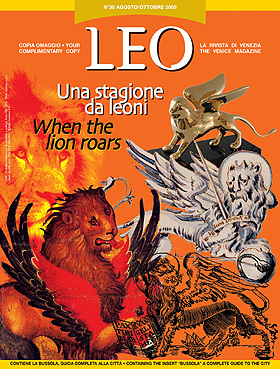 Venice's tourist organization, La Azienda Di Promozione Turistica, publishes an interesting quarterly magazine called Leo, which, rather than the usual species of unsanded commerical boosterism one might expect from a tourist board publication, can be smart and surprising. Check it out. It's available here online in .pdf format, in both English and Italian. Sure, there are the standard "things to do" articles, but hunt around and you'll find stories like this one about Tomaso Filippi, a postcard photographer who set up shop near Caffe' Florian near the turn of the century. Or a section called "Letters From The Past", which contains centuries-old missives on topics like the introduction of coffee or galley slaves. The links to the .pdf files appear at the bottom of every (inelegant) on-line story summary, so be sure to click through. The .pdf is a snapshot of the actual magazine, which is well designed and lushly illustrated. Note to Leo editor: please make the whole mag available on-line in one download, instead of making us click for every story. Sometime ago, I wrote about a new Venetian soccer stadium that was in the works, designed by Sydney-based architect Lawrence Nield. Following up, I found this rendering on his site (click it to enlarge it). Still says "Completion 2006", but you know how that goes. In the 1970’s, industrial pollution took a big chunk out of the fishing and aquaculture economy of the Venetian lagoon, throwing fishermen and fish farmers into crisis. 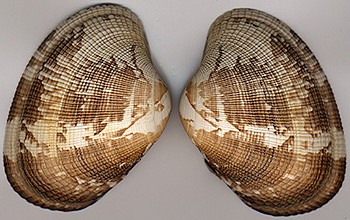 In response, in 1983, the Italian National Research Council experimentally introduced a variety of Philippine clam into the lagoon, near Chioggia. Mission: find a clam that both reproduced like rabbits and was able to tolerate the chemical poisons dripping into the veins of the lagoon from places like Porto Marghera. more and more fishermen have left traditional fishing activities in order to harvest the [Manila clam], which also guarantees high incomes (it has been estimated that a clam fisherman earns about €500 a day). These clams are not particularly influenced by seasons and can therefore be fished all year long. The capital required to set about clam fishing is also very low; only a small two-three person boat and a dump rake (called “rusca”) are necessary for the harvest. All these elements have fostered clam fishing, which has … become very popular among the young. Of course, there’s a rub. All that bivalve booty has brought out pirates. All kinds of illegal harvesting methods are being used, and it is sucking the precious sediment out of the lagoon, severely damaging its health. Especially harmful is the use of marine turbo-vacuum cleaners to hoover the mud. I remember how a friend once warned me to securely chain my outboard to my boat when I docked it, because he had heard that a group of fisherman from Chioggia often snuck into the canals of Giudecca at night to steal motors for use in churning up the clam beds. This may have been paranoia, but the local newspapers are rife with stories of the arrests of illegal clammers. As recently as last September 16th, the Gazzettino reported that 9 fisherman (including a 72-year-old) from Burano were popped for using high-powered outboards to stir up over a ton of clams. According to Patrizia Torricelli, professor of ecology at the University of Venice, even if these abuses stopped cold today, it would still take 6 years to restore the lagoon to health. But I wouldn’t count on that happening too soon. The lure of the Philippino gold is too strong. I’m trying to get an interview with Patrizia, so stay tuned on this story. 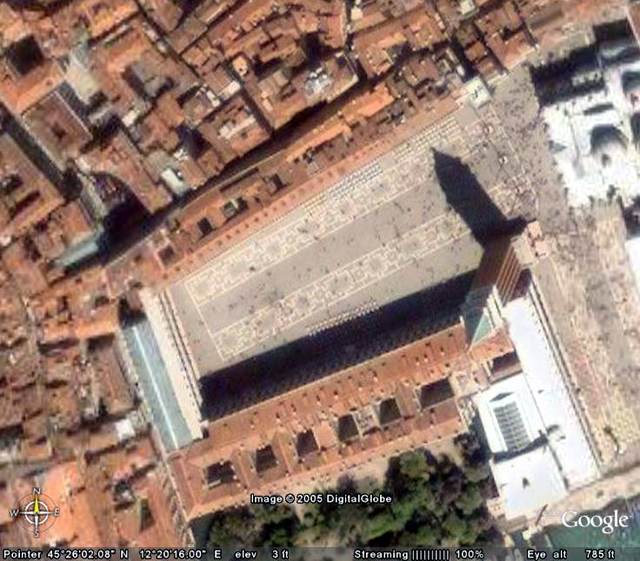 Google Earth is a free downloadable application that gives you an omnispheric photographic view of practically any spot on the planet. You start with the Gods-eye-perspective, slowly, smoothly zooming in from the outer atmosphere right down to a full-res 1000 foot vista, where you can hover and drift like a hawk. You can even tilt the axes toward the horizon for the looking-out-the-window-of-a-plane effect. You can easily program it to fly to/from any two points on the globe. This morning, I skipped Alitalia and flew from Laguna Niguel, California to Venice -- a 20-second journey that sends one skittering across the US, skimming over the Atlantic, and ultimately, homing in on La Serenissima like some kind of next generation intercontinental ballastic missile. So here are some snapshots from my mental mini-vaykay. Click on them for an enlargement. Piazza San Marco, from a little more than 1000 feet ... close enough to see the throngs fighting their way into the Basilica. If you squint, you can see customers at the tables of Caffe' Florian. This is a tilt-down view that sort of gives the illusion of relief, though of course the image is actually flat. (The closer in you zoom, the more obvious the flatness). On the right you see the Rialto. The lagoon is well-documented for the most part, too. Here's the seminary island of San Francesco del Deserto, with Burano in the background. At the blurry horizon, you can see Torcello. Here are water-taxis on their way to the airport, which you can just make out at the top of the image. More Venice map fun coming shortly. I've been steered toward two other cool, free programs you'll love.